As the first ever textile agreement between India and Sri Lanka became a reality, both neighbours mulled joining to enter a coveted global textile foothold-China, the world”‘s largest textile market. “…”China”‘s textiles are gradually moving from production to consumption. Using our strengths together-Sri Lanka”‘s first class garment manufacturing infrastructure and India”‘s quality fabric outputs-let us jointly compete for China”‘s textile market”‚ said a determined Ms Zohra Chaterji (Secretary of Indian Ministry of Textiles) on 09 September in Colombo. Ms Chaterji was addressing Anura Siriwardena (Secretary, Ministry of Industry and Commerce of Sri Lanka) on 09 September at Cinnamon Grand during her delegation”‘s official meeting with Sri Lanka”‘s delegation after the signing the first ever MoU between India and Sri Lanka on the same day at Galadari Hotel, Colombo earlier. During the successful Cinnamon Grand meeting, officials from both sides discussed in depth, of the modalities of the morning MoU and how to move forward and implement it in the coming months and agreed on the immediate next steps. A 2011 survey by “…”China National Garment Association (CNGA)”‚ showed the cost of Chinese textile and garment companies on labor, raw material, energy and financing were “…”in the uptrend”‚ and as such Chinese textile market shows promise for foreign imports. In its 2012 report, China Research and Intelligence Ltd estimated the Chinese textile market to be around $ 540 Bn while the combined annual exports of Chinese textiles and garments at $ 248 Mn. 40% of China”‘s annual industrial output comes from textiles. “…”The objective of this historic MoU being the expansion of the business and co-operation in the development of SME in Handloom, Power-loom and Textile sectors. The period of Memorandum of Understanding will remain in force for five years from the date of signing the MOU and it can be renewed thereafter. The key persons in the resulting Joint Working Group (JWC) are the co-chairs “-the Additional Secretary of the Ministry of Industry and Commerce of Sri Lanka and the Joint Secretary of the Ministry of Textiles of the Republic of India”-as well as members who will collaborate on this MOU. We strongly believe in the involvement of the private sectors of both countries in taking this process forward”‚ said Secretary Siriwardene, addressing the morning MoU signing event at Galadari Hotel. “…”We also observe that there appears to be much more unrealized potential for Sri Lankan textiles to serve the Indian textile markets and we are confident that this delegation will understand and support us to further enhance this direction. I would like to stress our strong appreciation towards Hon Anand Sharma, Indian Minister of Commerce and Industry who, during his visit to Sri Lanka in 2012 for his pioneering steps towards this bilateral textile MoU as well as for his extension of our textile export quota to India from three million to eight million pieces as a result of the successful Discussions he had with HE the President Mahinda Rajapaksa, Ministers Basil Rajapaksa and Rishad Bathiudeen. We thank especially the Treasury Secretary Dr PB Jayasundara for his untiring efforts in making this MoU a reality”‚ Secretary Siriwardena added. According to the Department of Commerce, total Indo-Lanka trade in 2012 stood at $ 4.086 Bn. During January – June of 2013, exports from Sri Lanka to India stood at $ 279.17 Mn while imports from India at $ 1465.65 Mn, showing a declining trend in imports from India. 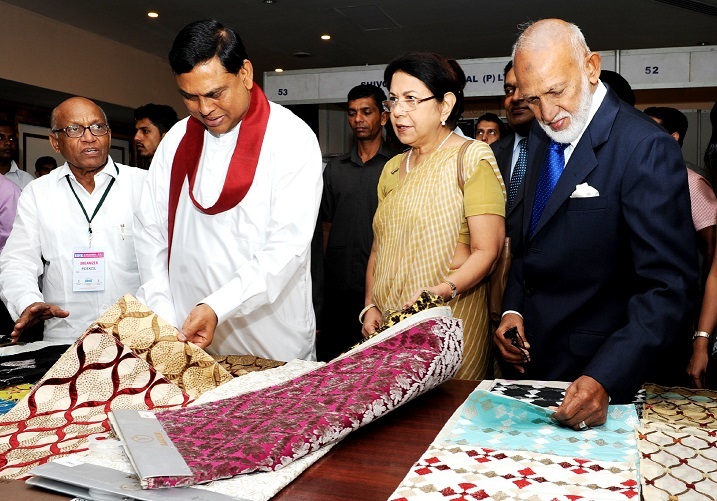 India”‘s appetite for Sri Lanka apparels and textiles too has grown steadily. Last year, India was the 8th buyer country of Sri Lanka textiles and garments with $ 64 Million which was a three-fold increase from 2008. Also last year India became the 10th buyer country of world famous Sri Lanka apparels purchasing $ 39 Million of apparels, which was a strong 44% increase from 2011. I am sure that you may already be aware that Sri Lanka Apparel has become one of the world’s leading proponents of ‘Ethical Business and Manufacturing Practices’ for the Global Fashion and Apparel Sourcing Business. In 2012 India also ranked the second largest buyer of Sri Lanka”‘s woven fabrics category with $ 20 million purchases which was a 42% growth from 2008.